Shortly after a qualifying session in which he and his teammate failed to make it into Q2, Sergio Perez sat down with the media to talk about a far more troubling matter, his legal move against Force India which resulted in the team going into administration. 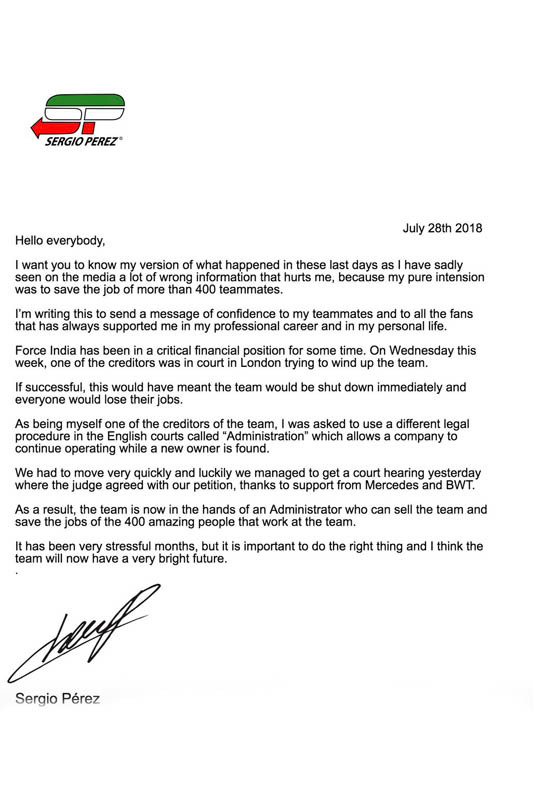 In the wake of the news that the Silverstone had been placed into administration and its affairs placed into the hands of FRP Advisory LLP, it was revealed that the move was led by Perez who is understood to be owed in the region of 4m euros, his action supported by Mercedes and sponsor BWT. "I love Vijay," said the Mexican. "My heart is really broken because I know this is not ideal in the short term for him, but the big picture is really different. "The bottom line of this is that we do this or the team would have gone bust," he continued. "That's what I get from the lawyers and members of the team. "There was a winding-up petition from another customer which would have closed down the team completely," he revealed. "Therefore I was asked to basically save the team, to pull the trigger and put the team into administration. It has nothing to do with my outstanding amounts. The only reason I've done it is to save the team and for its better future. "I am sure everyone appreciates what I've done and if they don't appreciate it right now, because a couple of members of the team don't know the full picture, they will appreciate it in a week's time or so." Aware of the situation for the last few weeks, Perez admits that worrying over the situation has impacted his driving. "Emotionally and mentally it's really tough," he said. "I haven't been able to focus on my driving and being a racing driver... I'm not going through a good time at the moment." Asked about team co-owner Vijay Mallya, he said: "He's going through a very difficult time, not just legally but also financially. "I hope that whatever happens, Vijay is happy with that and gets a good benefit from that. "Secondly, I hope to have a team that is more stable and can go on to the next level and be a racing team," he added. "We were not a racing team since the beginning of the year." A number of names are currently in the frame in terms of potential buyers, Canadian billionaire Lawrence stroll seemingly on pole. However, the Silverstone was keen to post a congratulatory message on Twitter tonight congratulating Nicolas Mazepin on his GP3 performance in Hungary, the Russian youngster's father said to be another potential buyer. Then again, nobody appears to have mentioned the elephant shaped pinata in the room... a certain Carlos Slim. In order that fans fully understand the situation, Perez subsequently posted a statement on social media (pictured). "It will be interesting which billionaire with the biggest ego takes over what appears to be an excellent team, bang for buck. What influence Merc has in all this could be important too as they use the team for driver development especially as Williams struggle. "